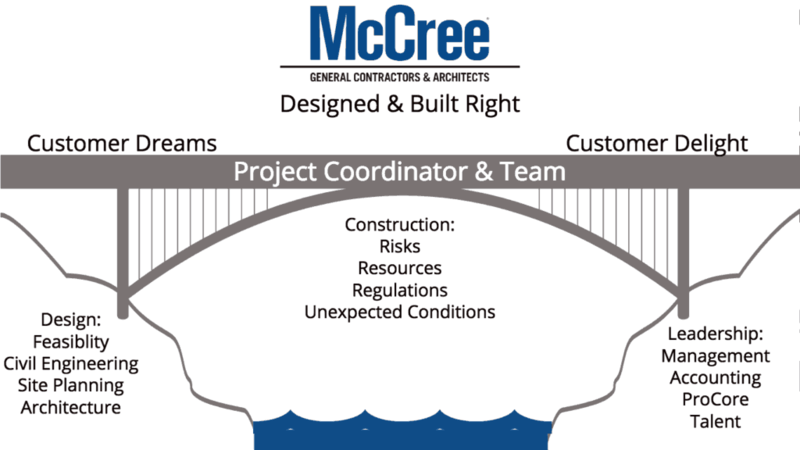 “Designed & Built Right” is the McCree promise that your project will be right, or we will make it right, period. This promise to you is more than words. It comes from W.A. McCree, Sr., our founder, with roots dating to 1914 to today with the very way our business is structured to be stewards of your best interests. We willingly accept the burden of designing and building so you can keep your schedule, meet your budget and confidently go about your business knowing your project is delegated and will be done right to the highest standards. Designing and building is an inherently creative as well as disruptive process with unexpected events always looming. Our promise, however, translates into a collaborative working relationship highlighted by budgets and schedules you can count on with building standards and finishes that stand the test of time. Confidence to promise you “Designed & Built Right” comes because McCree is organized and structured to consistently deliver on our promise. This isn’t a policy of quality control—it is who we are and the way we do business to serve our customers. We meet budgets and schedules because that’s what we do. We make your life and business easy from your dreams to your delight. Think of McCree as being like a bridge over your troubles that takes you from dreams to your delight the best way possible. As you glide across on the surface of the bridge, you’re in regular contact with your Project Coordinator & Team: Project Manager and Concierge. You’re protected from the many perils and risks due to integrating and coordinating engineering, architecture and construction. This single-point-of-contact approach for every aspect of your project simplifies your life and frees you to focus on your business. You gain high accountability, attend fewer meetings, get no excuses, gain time savings and bask in confidence that the right hand and left hand are working together to serve you. Below the bridge surface, out of sight, is a highly integrated team of professionals and craftsmen from the essential disciplines and trades needed to design and build your special project. Designed & Built Right is a promise backed by a family, a system and a team with a set of values of always caring for what you need to succeed. Your best interest is in our best interest.